The city of Austin was chartered in 1839. It didn’t take long for old-timers to start bellyaching about newcomers ruining everything. In 1991, I became one of those newcomers. A quarter-century later, I can grouch with the best of ’em. But some days I can still see beyond the traffic, the high-rises and the hipsters to the eternal Austin, where anyone can dance to their own song. It was on one of those days that I wrote this with Alton Rex. 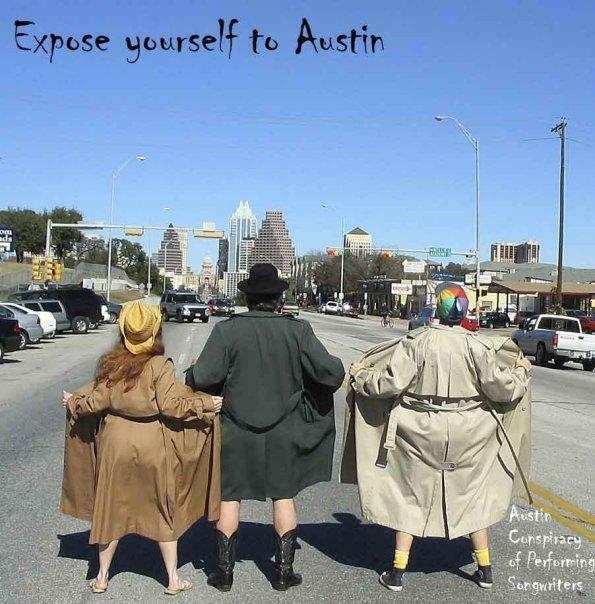 BTW, I’m the middle figure in the promo shot for the Austin Conspiracy of Performing Songwriters, the year we welcomed Folk Alliance to town. Did my time, up on Main Street. Drove my soul into the ground. And I laid my burdens down. But now, I’m Austin found. Made a wish on a wildflower. Stole a kiss by a moontower. I flung my arms around. Took a dive into Barton Springs. I can dance to my own song. That’s where I’m Austin found. A city from our town. Still wears that Violet Crown. We’ve all been Austin found.